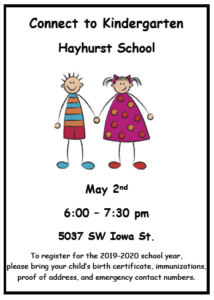 Hayhurst Connect to Kindergarten evening will be held on May 2nd, 6-7:30 PM at the school. Information and registration for incoming Kindergarteners for the 2019-2020 year for Hayhurst Elementary School. Please share with incoming Hayhurst Kindergarteners you know.